We’ve talked a lot about Google Doodles. Google loves changing their homepage logo, and they’ll dig up any old excuse to do so, and this week is no exception. 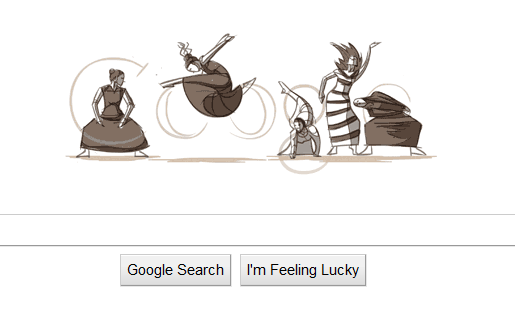 This week’s reason to create a new Google Doodle is modern dance legend Martha Graham; Google has created a dancing Martha Graham Doodle to honor her 117th birthday. Not that Ms. Graham is still alive (she died at age 96 and danced until she was 75), but still, the sentiment is nice. Martha Graham is considered by most in the field to be the creator of modern dancing as we know it, and was one of the foremost interpretive dancers in the field. The new logo is animated, which we’ve seen before in previous animated Google Doodles, but the interesting part of this animated logo? The dance movies the figure of Martha Graham performs are actual dance moves invented by Martha Graham during the 20’s and 30’s! That, combined with the beautiful artwork and graceful depiction of Google’s logo, makes for a top quality Google Doodle. It’s respectful and impressive in turn, much like Ms. Graham was.